Bridgehampton, NY - September 1, 2016 - Olympic veteran Peter Leone of Greenwich, CT, and Capito Z won the Equis Best Presented Horse Award, given to the best turned-out horse that is presented by its rider at the FEI horse inspection. Leone received the award at the 41st Annual Hampton Classic, just prior to the start of the first FEI-recognized competition, the $40,000 Sovaro Speed Stake. "It is a real honor that my horse, Capito Z, has been awarded the best turned-out horse," said Leone. "All the credit goes to his groom and caretaker, Valerie Huckstep. She is one of the best in the world and I am so happy for Val and my horse." Huckstep has been working for Leone for the past 16 years and was grooming for him when he received his team silver medal at the 1996 Olympic Games in Atlanta, GA.
"It was one of my best memories. We went into the ring with the horses and it was really exciting," said Huckstep. "To be able to take care of these horses is my whole life. I love it. Winning this award at the Hampton Classic is really great, very exciting." In 2015, Equis Boutique began sponsoring the award at the required horse inspection of FEI-recognized show jumping competitions on the East Coast. Alex West, national manager of Equis, presented Leone with a KASK riding helmet, the official helmet of the Hampton Classic. Leone was chosen by the FEI Ground Jury consisting of Phil DeVita, Oliver Kennedy, Neil O'Connor, Jennifer Ross-Koning, Steve Sarafin and Dalene Paine. 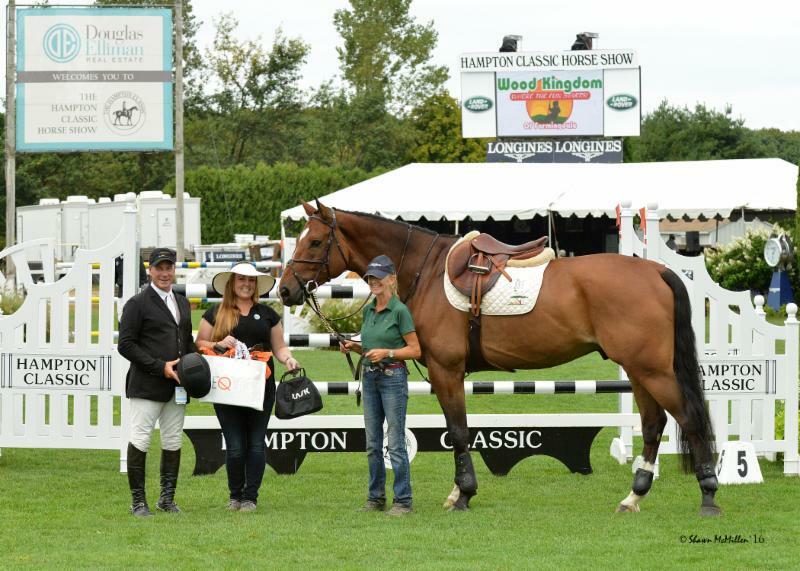 The Hampton Classic Horse Show runs through Sunday, September 4 at its pristine Bridgehampton, NY, venue. For this year's 41st annual edition, a fourth FEI class has been added to the schedule in addition to more than 200 classes of competition for horses and riders of all ages and abilities. A wide range of hunter, jumper and equitation classes are offered at all levels, from leadline all the way up to grand prix. Classes are also featured for riders with disabilities.